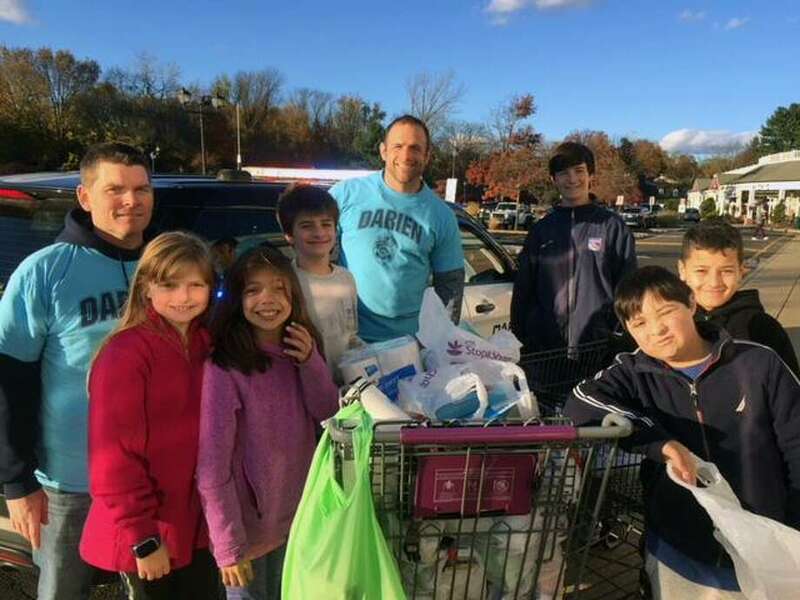 The Cops and Kids Adventure Program collected for the Darien Human Services Pantry, with help from Stop and Shop managers Roger Fajardo at Goodwives and Mike Donnelly at Heights. Pictured Darien police officers James Martin and Joe Licari with, from left, Jillian Licari, Nicole Yarish, Oliver Swift, Brennan Moore, Godfrey Gelineau and Marcello Fiorenza. The Darien Community Association Women’s Luncheons will feature “Home for the Holidays,” including trends, tips and a holiday shopping boutique with Diane Browne, of Browne & Co, and Laura Boulton, of Laura Boulton Events. The festive luncheon will take place at the DCA on Dec. 4 at 12:15 p.m. Boulton will showcase several tablescapes with tips to create different visions and set the mood. Browne’s luncheon menu will highlight holiday fare and recipes. After lunch, get a start on holiday shopping in the Browne & Co boutique. This event is $40 per person, or $25 for DCA members, and includes a lunch which will be provided by Browne & Co. Payment for this event is required by noon on Dec. 3, and can be made online at dariendca.org, or by contacting the DCA at 203-655-9050 ext. 10. The DCA is located at 274 Middlesex Road in Darien. Darien’s Good Wife’s River DAR Chapter will host its annual Christmas party at the home of DAR member, Winifred and husband Tom Lom on Dec. 9. Members, prospective members, husbands and significant others are invited. RSVP to Vice Regent Tracy Root for attendance and food assignments. Good Citizen Chairman Kim Kiner will present the Good Citizen Award to a community-minded patriotic senior from Darien High School. Prior to this presentation, GWR Chapter Regent Katherine Love will update members on several future Connecticut state and local DAR events. Eight new members will be honored and welcomed during an induction ceremony. Veteran’s Chairman Carol Wilder-Tamme will be collecting comfort items to be delivered before the holidays to veterans at the Veterans’ Hospital in North Haven. The Chapter also encourages participation in and promotes the annual Wreaths Across America project which places a wreath on the veterans’ graves in Darien’s Spring Grove Veterans Cemetery at noon on Dec. 15. The local DAR chapter partners with other local civic groups in wreath fundraising efforts. Chef and caterer Laura Christie, of Christie Caters, will bring a twist on an English tea to the Darien Community Association’s historic mansion on Dec. 6 at 12:30 p.m.
Christie’s menu includes a variety of mini scones and tea sandwiches, with some creative updates and additions, such as goat cheese and apple scones, and mini avocado toast with micro greens. A third course of mini butternut squash and sage quiche will enhance this experience. An assortment of holiday cookies and mini sweets will follow. Harney & Sons teas will also be served. Seating begins at 12:30 p.m. Fees are $45 for DCA members; $55 for the public. Payment is required by Dec. 4 and may be made online at dariendca.org or by contacting the DCA at info@dariendca.org or 203-655-9050 ext. 10. Longtime Darien resident, avid sailor and Noroton Yacht Club member Douglas Bora, was unanimously elected as SoundWaters chairman by its board of directors during the organization’s annual meeting on Nov. 13. Bora takes the wheel from outgoing Chairman Scott Mitchell, of Greenwich, who had served in the role since 2013. As chairman, Bora will lead a 30-person board of directors to assist SoundWaters President Dr. Leigh Shemitz and her team, to grow the organization’s capacity through strategic planning and fundraising. From its two educational facilities at Cove Island in Stamford and in Stamford Harbor and aboard its 80-foot schooner, SoundWaters teaches the science of Long Island Sound to more than 30,000 students each year from 150 schools in 65 communities throughout Connecticut and New York. Bora will be the seventh board chair in SoundWaters 29-year history. He is also managing director of Spinnaker Real Estate Partners LLC, a real estate development company engaged in the acquisition, development, ownership and management of commercial and residential properties.